25 East Gallery is pleased to present There Are Dog-Years and The Infinitely Small, a group exhibition which brings together artists whose practices of archiving, preserving, and mapping histories create new, hybrid artifacts. The work in this show speaks to the intimate, social, historical, and political possibilities of archiving, and the unsuspected malleability of something so fixed as the past. Materials of the past, such as photographs, written letters, postcards, diaries, childhood homes, family traditions, and oral histories are reframed to retell old stories while beginning new dialogues. Artists such as Alec Snow, Gemma N.A. Hunt, and Rosalind Aparicio-Ramirez recreate preexisting architectures to capture their sentimental capacities. Anna Archibald and Rachel Leckman cull through family images and text as source material to create new narratives, and blur the line between history and fiction. Laure Hocine and Yin Wong explore ephemerality and the slippage of time as a theme, while Emmalee Johnson-Kao and Eva Pedriglieri utilize this temporality as a condition under which to create their work. In this exhibition, the archive emerges as a mechanism of display, an imagined space, and a system of gathering and orienting materials around one another. 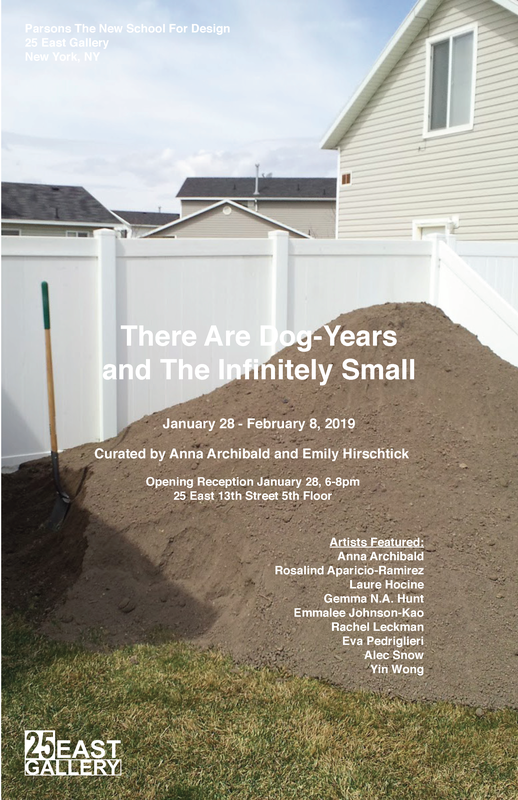 The title, There Are Dog-Years and The Infinitely Small, taken from Laure Hocine’s artist statement, speaks to the imprecise nature of measuring time, and nostalgia for an elastic sense of duration and place. In their explorations of storytelling and alternative methods of communication, these nine artists interrogate the distinction between the source and the recreation, the personal and the communal, the preservation of something old and the creation of something new.